Phillys Best (note shameful lack of apostrophe) is a chain of cheesesteak shops with 20 locations in SoCal, including three in the Inland Valley (see above). Because the number is so limited, Phillys Best qualifies under my ground rules here of focusing on mom and pop or relatively scarce chain restaurants. I’ve been to the Phillys Best on the periphery of Ontario Mills a few times over the years. They have a range of steak sandwiches, hoagies, burgers and chicken sandwiches. I visited this week for a mushroom steak with cheese ($7.50). It’s a hearty sandwich and like the others is served on a soft Amoroso brand roll from Philadelphia. I see in the fine print that the cheese is American and that you can substitute provolone or Wiz, as in Cheez Wiz, which cheesesteak-wise is technically more authentic, albeit disgusting. They have above-average fries ($2) and, for people with East Coast tastes, Wise brand chips, Tastykakes and Frank’s Soda. 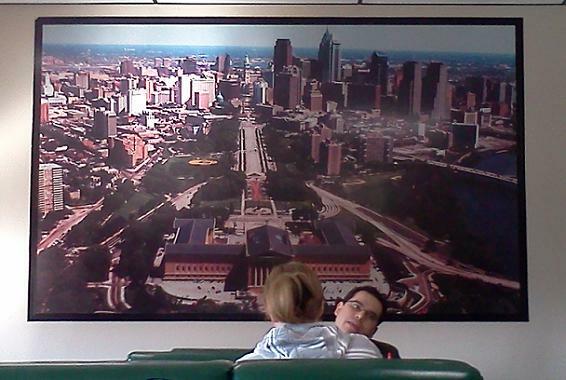 The decor is sparse but includes boards listing Philly natives and Philly trivia and a blowup aerial photo of the city. I haven’t been to Philadelphia and can’t judge how the cheesesteaks here compare, but they taste pretty good to me, and the result seems a lot more Philly than, say, Sbarro is to N.Y. If you’ve been, what do you think? This entry was posted in Restaurants: San Dimas by David Allen. Bookmark the permalink. I lived just outside of Philadelphia for 20 yrs. 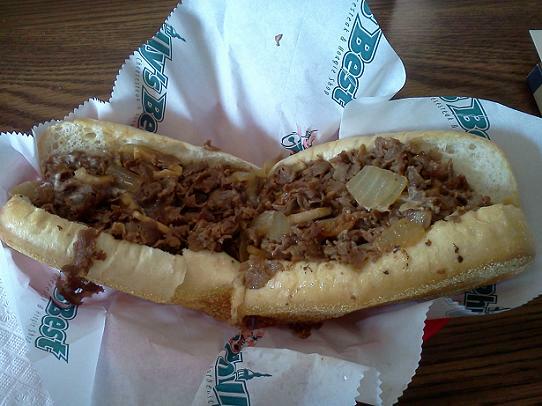 and have eaten at both “Geno’s” & “Pat’s,” the rival cheesesteak kings of Philly. When I first moved back here, my brother Tom took me there for my birthday sensing I missed the east coast. THESE ARE THE BEST AROUND!! And it’s all about the Amoroso rolls, the right cheese, and grilled onions. To put anything else on a true cheesesteak is sacrilege. I don’t like the Cheese Wiz. I get provolone. Oh! Gotta have a Birch Beer with it for the true experience. Jane is right! I go there 2-3 times a month, especially when they are running their $5.00 special. Cheesesteak with provolone, grilled onions to go so I can listen to KFI while eating lunch. I agree with both Jane and Bob. Phillys Best is a great substitute for “authentic” cheesesteaks, however I noticed some disparity between local Phillys Best locations… maybe different ownership? Yes, they are all franchised so some things are a little off in each store. There is also one off of Limonite in the Lowe’s center…also a Five Guys is there, too.